Cedar Lane Farm Stand REOPENING! Posted 4/12/2016 3:42pm by Gregg Keckler. Greetings! We have been hearing from so many of you over the last year since we closed our farm stand at Cedar Lane Unitarian Universalist Church that we decided to reopen the stand! We hope that you will come out and support us as you did in the past. Encourage your friends! If you had a CSA with us in the past, we would love to have you come back and choose Cedar Lane U U Church as your pick up location. Fridays will hopefully fit everyone's schedules. Beat the traffic by coming in the early afternoon or come after work. Gregg will be there beginning May13. Our usual fresh fruits and vegetables in season as well as our own beef, pork, eggs, jellies and jams and honey will be features each week throughout the spring, summer and fall. We will also have Whispering Brook Farm cheese. On May 13 the stand will have a wide selection of bedding plants including flowers and vegetables. Be sure to put it on your calendar. Posted 4/8/2016 4:51pm by Gregg Keckler. We wanted to let you know about a change that we are making regarding Friday deliveries. If you haven't signed up yet for the 2016 CSAQ season. We have decided to change the Friday deliveries to Wednesday deliveries. We are trying to clean up our schedule and make the van as full as possible so that we are not making the same run twice a week when all the shares could be put on one van once a week. I hope that this change will help you to make a the decision to sign up for the CSA this year. If you had difficulties with the Friday delivery because you tend to take long weekends then maybe the Wednesday delivery would suit your schedule better. Also Gregg will be making these deliveries very early in the morning on Wednesday, so you will be able to get your fruits and vegetables in the frig before you go to work. Thank you for supporting our farm in the past and we look forward to seeing you again this year. Posted 4/8/2016 4:43pm by Gregg Keckler. We are trying to make a few changes in order to clean up our schedule. Since the Friday CSA deliveries have been getting less and less each year and all our efforts to grow the Friday deliveries have been in vain, we have decided to move the Friday deliveries to Wednesdays. I hope that this is still convenient for everyone. If you absolutely cannot receive your CSA on Wednesdays, we will be happy to cancel your subscription and refund your money. We would still be making the deliveries to the same locations. For most of you, since your locations are your homes, you will be getting your CSA before you leave for work, so you will be able to get your items in the frig right away. So... maybe it will be a better deal. Also if you tend to go away for long weekends, you will not have to worry about missing your delivery or having to donate it. We do hope that this will work for all of you. Again, please let us know if you have any difficulties and we will understand. Posted 3/15/2016 7:13am by Gregg Keckler. We have been planting a lot of different seeds in the greenhouse - broccoli, spinach, lettuce, Swiss chard, red beets, greens. We have been having a visitor in there every night. He digs up the spinach seeds and cracks them in two and eats the insides. Gregg has tried mouse and rat traps with seeds and peanut butter on them, but to no avail. He has also used several sticky traps, but nada. We might have to try a box trap or better yet, we might just put a couple of the cats in there for the night. We must do something fast or we will not have a planting of spinach at all. Oliver, Juan and Gregg planted peas, potatoes, onions and shallots in the field last week in the great warm weather. The garlic are looking great! We have German hard neck, California, and Elephant. This should be a good year for garlic! The high tunnel is ready to go! Gregg has been out there planting early things for the first markets in late April and Early May. We have 5 hogs in the freezer now waiting for the new season. We have great sausage, pork chops and steaks ready for the markets and CSA to start. The chickens are still laying well. We have an overabundance of eggs. If anyone would like to make the trip to the farm to get great, farm fresh, brown eggs, let us know. We would love to have you visit and pick up some eggs. The new layers are doing great. No losses! They are only about 10 weeks away from laying. We will be taking a steer to the butcher in a couple of weeks so we should have a good supply of steaks and ground beef for the beginning of the season. We have decided not to have a work day this spring. Instead we will be having a special farm day with great food, tours, wagon rides and pick what you like later in the year. Keep watching for details. We are grateful to all who have signed up already for the CSA. Each new growing season is a time to start over, try new things, continue with old tried and true seeds and plants. We love the bustle and renewal of spring. We hope that if you have not committed yourself yet to the CSA - do it now! We depend on all of you to eat the vegetables and fruits that we grow. A weekly share of fruits and vegetables is a great way to start your meal planning for the week. It will take away the problem of what to have for dinner tonight. The vegetables that you will get in your share will make the decision for you! It is hard to believe that the first market is on April 19th at NGS. By the first week of May most of the market will be open and ready to go. We can't wait to plant radishes for that first week. We hope that you will come to one of our farm stands or markets early in the year. We would love to meet you and provide you with fresh greens and asparagus! Oliver is nearly finished his big project for this year. His kitchen cabinets are in, the floors are almost all varnished, and the lights are mostly in. Gregg is finishing up the last of the frozen fruits for the jams and also using up the softer apples for applesauce. He made Shagbark Hickory syrup and fresh apple juice. My mother is in her 80's, and loves to make apple butter, so she has been working at that for the last month. We are enjoying the spring time. The rains are much needed. The lilacs are budding; daffodils are blooming; winter aconite and alpine beauties are blooming in all the flower beds. We hope that you will take the time to notice them. They are refreshing, living examples of change and continuity. Change- since the winter is past; the rains are over and gone. The flowers appear on the earth; the time of singing of birds is come. Yet continuity - because we can depend that each year will produce the same winter, the same summer., the same flowers and the same snow. I am trying to keep after posting pictures on facebook from time to time. If you would like to keep track of what we are doing, follow us on facebook. Posted 2/26/2016 2:35pm by Gregg Keckler. CSA Special PROMO for MARCH ONLY! We are doing a little promotion to try to boost the CSA sign ups for 2016. If you get a friend to sign up for a CSA with us for the 2016 season- any session- any size and we will give you a FREE box of vegetables or a FREE farm fresh broiler chicken raised by us! I have added a question on the CSA sign up page - "Who told you about our CSA?" Your friend just has to put your name in the blank and you will WIN! Now the stipulation- This must be a NEW member - never signed up before and you must also be signed up as well. Sign up now and start telling your friends! The deadline to get a friend signed up for the FREE prize is March 26. Posted 2/19/2016 6:46am by Gregg Keckler. Everyone is cozy and snug in all the winter snow and ice. The pigs, the chickens the new layers, the fruit trees and the garlic are all doing well and enjoying the respite. We hope that you are too. Gregg is making jam and shagbark hickory syrup. Gregg has been buying lots of seeds for next year's growing season. Many tried and true varieties, but he also loves experimenting with new varieties to grace the market stands. Oliver is learning new skills. He has totally rebuilt the inside of his new old house. After knocking down all the horsehair plaster from the walls and ceilings to expose all the old logs and chinking, he has been learning how to chink, run electric, jack the floors up, put in a furnace, and hang dry wall ( why is it called 'hanging' dry wall especially when it is on the ceiling?) He is enoying his experience and learning many things. We remember a similar experience 32 years ago when we bought this house. It is a great time! Oliver will be getting married in October and he is hoping to have the house liveable by April since that is when the farm work really gets going. Juan has been helping Oliver and teaching him about dry wall, window replacement and other renovation projects. We have finally got the electric in the high tunnel. Daniel did the box and Oliver ran the wires so we should have a better system for fans and side panels this year. We have been fixing crates, cleaning, spreading manure and repairing many things. We have a good spring of water at the Myerstown Road property very near the barn which would be great for getting water for the 500 chickens up there. We are trying to contain the spring and add pipes to channel it to the barn, but we have to be able to keep it from freezing. This project is still in the thinking stage. We are into our new CSA subscription season. If you have not signed up yet now is the time. Do not procrastinate. May will be here before you know it. The deadline to sign up for the full season and get a 6% discount is May 15. If you would like to have a drop off at your location. Let us know and we can get you started. We would like to have 6 shares (any size) to do a drop off. We have already taken 5 pigs to the butcher in the last week. So we will be stocked to start out the year at the farm stands and markets in May. It usually takes about 6-7 pigs per year. So we are doing good. We still have a boar, gilt and three smaller pigs. The five hundred chicks that we got as day olds back in December are doing well. We did have one disaster which costs the lives of about 85 of them. When Gregg and Oliver were transferring them from the brooder house to the big barn on Myerstown Road, they loaded them into the back of the pickup. ALL 500!! AT ONE TIME!! They thought that it would only be a very short trip and it was so cold that they would be OK even if it was a little too crowded. Unfortunately that was a bad idea. They were too crowded and began to over-heat. So we ended up losing about 85. So we probably only have just over 400 now. But since the move they are doing GREAT! We butchered 50 of our old layers. So we will have some stewing hens for the first markets. We also ordered 300 broilers to be delivered later in the spring - for fresh chicken. 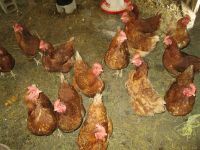 We have found that by increasing the number of chickens that we do, we can afford to charge a lower price/lb. That will be good news for our customers. We have 6 steers at this time. They are enjoying the great hay from the summer and old pumpkins and winter squash. We are still going to be at the same markets and farm stands as last year, except Gregg will be going to Bush Hill Presbyterian Church on Fraconia Rd in Alexandria. If you are in the area, come out to buy on Saturdays beginging in May. It is hard to believe that the markets will be opening in May. Gregg and I are always reading and enjoying new and old books. Gregg is currently rereading Thomas Sowell's Basic Economics book. He has just finish a good book call Ataturk in the Nazi Imagination by Ihrig. He just recently picked up The Chosen by Potok and reread it also. I have been rereading Our Mutual Friend by Dickens, William Bennett's books on American History, The State of the American Mind edited by Bauerlein and Bellow and It All Turns on Affection by Wendell Berry. We are always trying to improve our knowledge of animal husbandry and soil science as well, therefore Storey's books are always out on the table. Besides his practical learning this year, Oliver has been studying pond management. He also bought an full size accordion and has been teaching himself to play. He is pretty good. At Christmas he went Christmas caroling with his accordion to all his sisters' houses serenading them in the middle of the night! Please enjoy the great winter time. It seems as if the plants and trees are just waiting to burst forth. We have been seeing flocks of robins, so we know that Spring is very close. Let me know if you have any questions or if you would like to make the trip up here to visit and get some GREAT FRESH eggs! We are loaded with them. Posted 1/20/2016 3:42pm by Gregg Keckler. We are anticipating a great new year for our farming, CSA and Farm Stands. We will be returning to all the same markets and Farm Stands -except St. Mark's Episcopal in Alexandria will be moving to Bush Hill Presbyterian Church in Alexandria. We will also be planning to return to all the CSA drop off locations for 2016. If anyone would like to get a new CSA drop off location added - just get at least 6 shares delivered to the same location and we will add your stop. Let us know if you would like any information about this. It is time to sign up for the 2016 CSA season. You can go to the website www.orchardcountryrproduce.com and sign up. You will get a 6% discount for signing up for all three sessions if you pay before May 15. You can pay online with a credit card or you can arrange a payment plan online or you can pay with a check and save another 4%. We look forward to providing you with fresh vegetables and fruit again this year. We are busy into our winter jobs. Gregg is making jam and applesauce. He is also the main caretaker for all the hogs, chickens and chicks. Speaking of chickens, we still have 50 brown egg layers that are giving us lots of fresh eggs. They are beginning to pile up. So if anyone wants to make the trip to the farm, we will give you a great discount for buying some eggs. We also have apples and meat available. Let us know if you would like to come up. You could stock up and sell them to your neighbors! Oliver and Juan are working on Oliver's house. They gutted the whole thing last month. Now they are chinking between the logs. (It is log cabin) and putting up drywall. Oliver loves giving tours and sharing his plans. Come for a tour! We have an old three-bottom plow. It was rather worn and broken in several places. We tried to purchase new pieces, but they were not available anymore. So Oliver got his future father-in-law to weld parts and build new pieces for it. But before we could get it finished the ground froze. So now we will have to wait until spring to plow this new 3 acre plot that we would like to add to the vegetables. If you haven't seen it yet, we posted a picture of all of us on FACEBOOK. We are growing! We added two grandlchildren in 2015 and in 2016 we will be marrying off the last two children. Virigina is will be marrying Dan Shedd in April and Oliver will be marrying Elizabeth Brown in October. WOW! An empty nest! What will we do! I made a New Year's Resolution - to add pictures or blurbs to the FACEBNOOK page periodically throughout the year. So if you keep up with those things follow us on FACEBOOK! Let us know if you have any questions or if we can help you in any way. Have a great month! Posted 1/20/2016 3:40pm by Gregg Keckler. Thanks to all who invested in the capital land purchase for 2015. Your help was greatly appreciated and you helped us to avoid costly bank payments which takes money away from farming. Heads Up! We will be making another balloon payment in September, 2016. If you have any money sitting in a bank account making no interest and you would like to help us with farming land purchase, let us know and we can give you more information. We will make it worth your while. Posted 12/21/2015 2:43pm by Gregg Keckler. National Geographic Society - Tuesday, December 22 from 9-2pm in the courtyard. Come out to buy apples and vegetables and wish Gregg well! cookies Peanut blossoms, chocolate chip and oatmeal raisin!!! Posted 12/18/2015 2:33pm by Gregg Keckler. Come out and wish Oliver well!